Medication Packaging known as “MoosePacks” includes specialized packaging designed to assist patients with medication organization by incorporating date and time into the unit dose device. This service includes the pharmacist working with the patients and/or their caregivers to determine best time of day to take medications. Medications are organized into special packaging and provided to you the same day each month. Medication packs may be delivered to your home. The pharmacist will work closely with patient, caregivers, and prescribers on a continual basis to make sure that the medications including dosing regimens are up-to-date routinely. Go to mymoosepacks.com for more information! Prescription Synchronization (also referred to as Medication Synchronization) allows for increased convenience for you by experiencing fewer trips to the pharmacy and enjoy your time without worrying about scheduling your medications. Moose Pharmacy has the ability to work with all customers to align all of the medications in his/her daily routine to be filled at the same time each month. Our pharmacists will provide clinical medication management and monitoring for progression toward desired therapeutic goals during the time of medication pick-up or delivery. 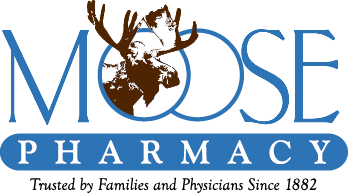 The Moose Pharmacy Compounding Lab is based out of the Moose Pharmacy of Concord Location. Compounded medicines are available only with a prescription written by the provider. All compounds may be delivered or picked up at the Moose Pharmacy location of your choice. Natural Hormone Medication (suppositories, vaginal creams, vaginal gels, absorbent gels to place on the inside of your arm, topical gels, oral capsules, oral tablets, etc.). Pain Medication (for patients unable to swallow capsules or tablets; topical gels, topical creams, tablets that dissolve under the tongue, suppositories, suspension, syrups, etc.). Veterinarian Medicine (for finicky animals that dislike the taste of medicine, their medication is compounded into flavors suitable to each animal in a treat or topical form). Medications can be quickly and safely delivered to your home. We proudly offer free delivery services throughout Cabarrus, Rowan and Stanly counties. Additional locations also apply. Call pharmacy for additional details. Immunizing pharmacists are available at all Moose locations. We provide complementary immunizations screenings following recommendations of the Centers for Disease Control (CDC) and Prevention through Advisory Committee on Immunization Practices (ACIP). Flu, pneumococcal, tetanus and herpes zoster vaccines are available daily. Additional vaccines may be provided as recommended by your health care provider. Medical research shows that individuals react differently to medications, due to their unique DNA. Pharmacogentic testing analyzes how your genes guide the metabolism of prescription and over-the-counter (OTC) medications. At Moose Pharmacy, we can assist you in identifying how you uniquely metabolize a medication. We will work with you and your medical providers to design a personalized treatment plan with medications that work best for you. A licensed pharmacist can assist in a variety of consultations helping to optimize the best medication regimen or over the counter product based on your needs. In-depth Medication Therapy Management sessions are available with your pharmacist to ensure you are the most cost effective, simple regimen. Whether your priority is to reduce the cost of your prescriptions, understand your disease-state better or simplify your medication regimen, our pharmacists can help. Our pharmacist will meet with you for a comprehensive assessment of medications, including prescription, over-the-counter, herbal medications and dietary supplements to identify medication-related problems, prioritize a list of medication therapy problems and create a patient-specific plan to resolve medication therapy problems working with the extended healthcare team. Are you eligible for a Medicare plan, but not sure where to start in selecting the available options? Selecting a plan can be complicated, but we are here to help by offering iMedicare Consultations. iMedicare Consultations are available to assist you in selecting the most cost effective option for you. During this one-on-one encounter, our professionals sit down with you and determine a customized report so that you are aware of the options that are best for you. This complementary service is available by appointment only. If you prefer natural supplementation, Moose Pharmacy offers a complete line of pharmacist recommended products. Consultations are also available to determine which nutrients may be depleted from the body due to prescription medication use or lifestyle.